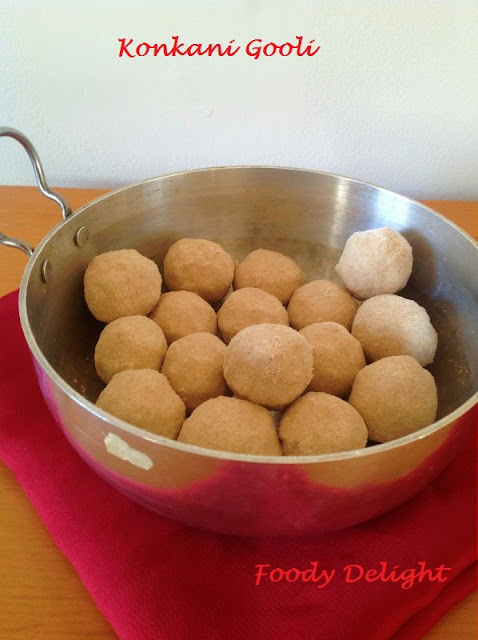 Today let me introduce you all to one of the easiest festive konkani sweet. 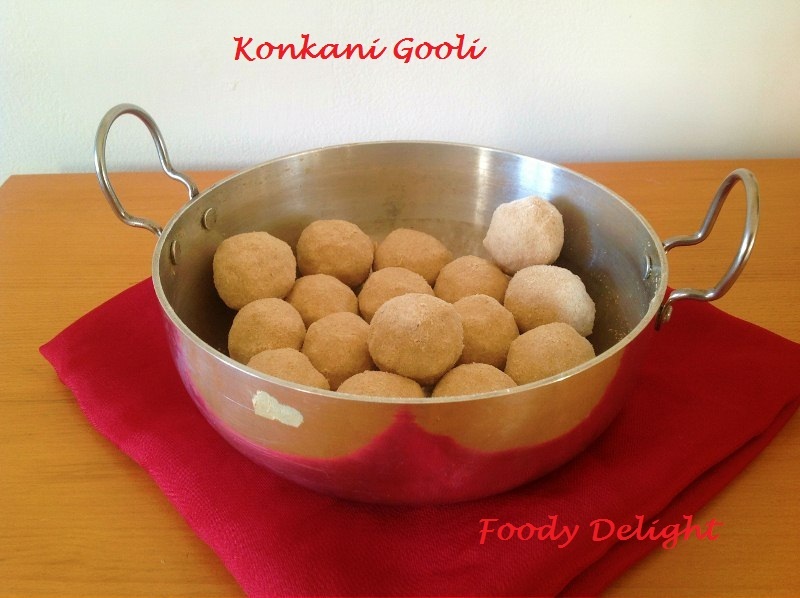 These ladoo are named ad "Gooli" in Konkani language. They are prepared with fine variety of wheat flour and ghee. Then sweetened with powdered sugar. I am very fond of these ladoo. My mother always make it in large quantity and store it. These ladoo lasts for month. And now I want you all to try these simple sweet and make your family happy. Caution: When eating, do not talk. These ladoos gets stuck to the upper jaw. So be carefull. Heat wide bottomed pan and add ghee into it. Once ghee melts add 1 cup of wheat flour and fry the flour till it slightly changes its colour. When done, empty it into clean and dry plate. Repeat the same process with remaining flour. When you have finish frying the flour. Allow it to cool down for sometime. Then mix in powdered sugar and cardamom powder. Then start making ladoo. These ladoo may break while shaping. But no problem you can make them with little patience. Notes: Check the sweetness. if needed add more powdered sugar. If your not able to shape the ladoo, add more melted ghee. 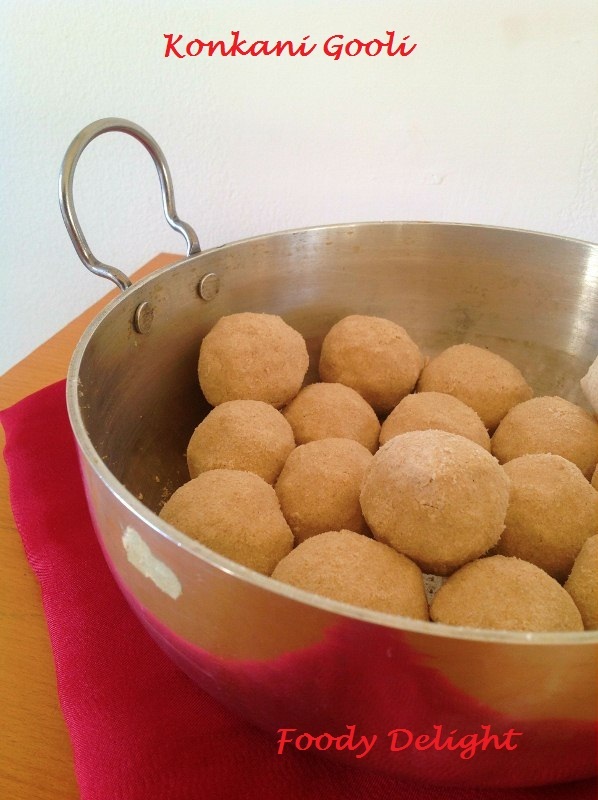 Shape the ladoo with dry hand, if you want your ladoo to stay for many days. Excellent laddoos,love to grab one and have rite now.